Bourbon Caramel Fudge – This fudge is rich, creamy, and laced with a hint of smooth bourbon. Then it’s topped with a layer of silky, homemade caramel sauce making it an irresistible sweet treat perfect for the holidays! The holiday season is in full swing, and the best part is yet to come! Don’t get me wrong. Thanksgiving is always a lot of fun, and I’ve certainly enjoyed my fair share of mashed potatoes, blueberry pie, sage stuffing, and a martini or two. It’s time to move on to Christmas, and all it’s festivities. One of my favorite things to do every year is to bake and make candy. Some of my go-to recipes are sugar cookies, English toffee, and peppermint bark. Fudge is also a yearly traditional, but this time I wanted to change it up a bit. Instead of making a mint chocolate fudge, I opted for this bourbon caramel fudge. It’s so incredibly smooth and silky. You won’t believe how easily it comes together. The longest part is waiting for it to set. Prepare a 9 x 9-inch baking dish by lining it with parchment paper. Place the chocolate chips and sweetened condensed milk in a large pan, and melt over low heat. 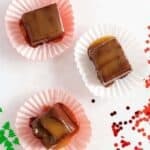 *Check at “Tips” section at the end of the post to see how we make easy caramel fudge recipe in the microwave. Stir continuously to prevent the chocolate from burning. After the mixture is smooth and the chocolate is completely melted, add the butter and salt. Stir to combine. Remove the pan from the heat, and add the bourbon. Mix thoroughly, and pour the fudge into the prepared baking dish. Set aside, and get ready to prepare the caramel sauce. Add the sugar, water, and lemon juice to a medium pot with tall sides. Having tall sides is important, because the caramel is going to boil and expand later in the process. The important thing here is to gently stir the ingredients to combine, but don’t stir them again while they are coming to a boil or boiling. Bring the ingredients to a boil over medium heat until the sugar begins to turn a golden brown color. Don’t let it get dark, or it will burn. Carefully pour in the heavy cream and butter. This is the point where the sauce will bubble and can overflow if the pan is not tall enough. It’s also okay to stir now, so remove the caramel sauce from the heat and stir to combine. The temperature will come down some, and the mixture should stop bubbling rather quickly. However, it’s still extremely hot and can cause serious burns, so handle with care. Immediately pour the hot caramel sauce over the fudge, and place it the refrigerator to set for at least 4 hours. I’ve left a pan in the fridge overnight, and it worked well, too. After the fudge sets, remove it from the pan, and cut into squares. Caramel fudge is very soft. Soft enough to leave a finger indentation when you pick it up. It makes a great gift idea, but I wouldn’t recommend stacking it. Otherwise, it may stick together in clumps. It would be cute in a small gift box or shallow gift bag. The caramel does ooze, so keep that in mind when you’re packing it for storage. Keep any uneaten fudge in the refrigerator for up to 5 days in a sealed container. I love making recipes easier, so as promised, here’s some tips on how to make this fudge recipe in the microwave. Combine the chocolate chips and sweetened condensed milk in a large, microwave-safe bowl. Microwave on high for 3-4 minutes, stirring in 15 second intervals. When the chocolate is melted, and the mixture is combined, add the butter, salt, and bourbon. Stir to combine. Then pour it into the prepared baking dish. Feel free to substitute your favorite jarred caramel sauce for the stove top version. The consistency will be different, but it takes away worry of it not turning out or burning. 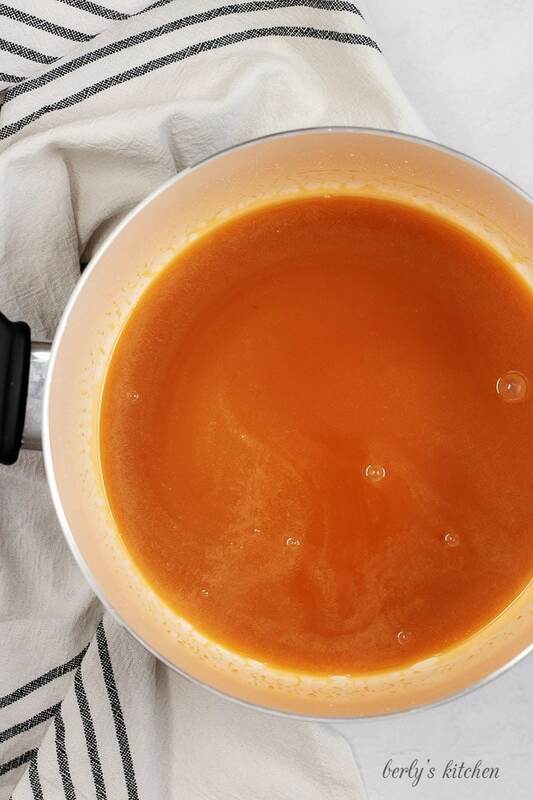 If you are making the caramel sauce from scratch, but are a little hesitant, here’s a great article that explains the science behind how everything comes together. It also gives some handy information on how to avoid common mistakes. 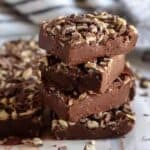 One of our most popular questions across the board is, “Can I freeze this dish?” Fudge has never lasted long enough at our house to make it to the freezer, but I did Google it. Fudge does freeze well as long as it’s wrapped and covered properly. 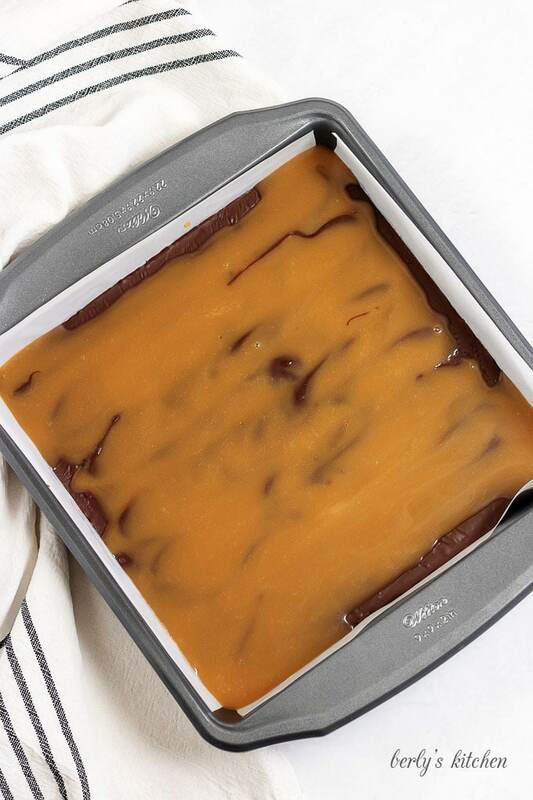 If you like this bourbon caramel fudge recipe, please leave us a comment and rate the recipe card. You can also find us on Facebook, Pinterest, Twitter and Instagram searching for Berly’s Kitchen! 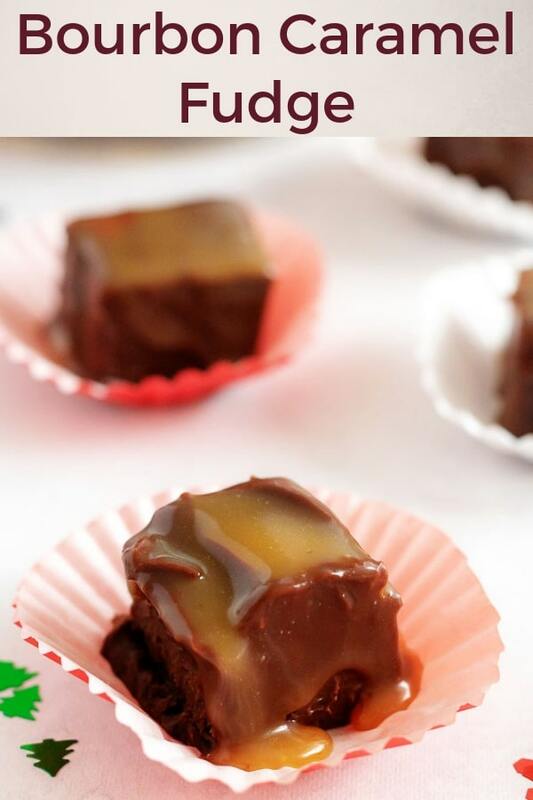 Bourbon Caramel Fudge - This fudge is rich, creamy, and laced with a hint of smooth bourbon. Then it's topped with a layer of silky, homemade caramel sauce making it an irresistible sweet treat perfect for the holidays! Line a 9 x 9-inch baking dish with parchment paper. Set aside. In a large pot, combine the chocolate chips and sweetened condensed milk. Heat over low-medium, stirring continuously. After chocolate is completely melted and mixture is smooth, add the butter and salt. Stir to combine. Then remove from heat. Add the bourbon, and stir until completely mixed. Carefully pour the fudge into prepared baking dish, and use a spatula to smooth it into an even layer. Set aside. In a medium pot, add the sugar, water, and lemon juice, Give it a gentle stir (just to combine ingredients), taking care not to splash any on the side of the pan. DO NOT STIR AGAIN DURING THE BOILING PROCESS. Bring the ingredients to a boil over low-medium heat, and continue to boil until the sugar becomes golden brown in color. Carefully add the heavy cream and butter. The mixture will bubble a lot, so take care not to let it boil over. 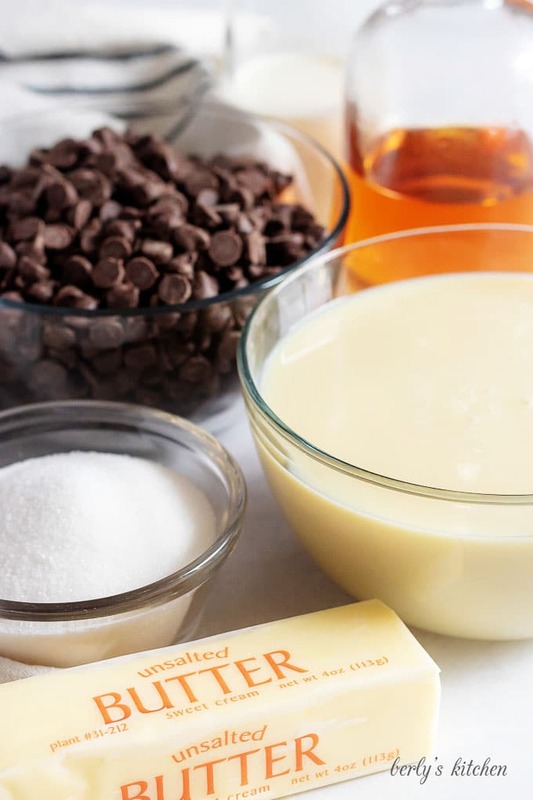 Remove from heat and stir until the heavy cream and butter are combined, and the caramel is no longer boiling. 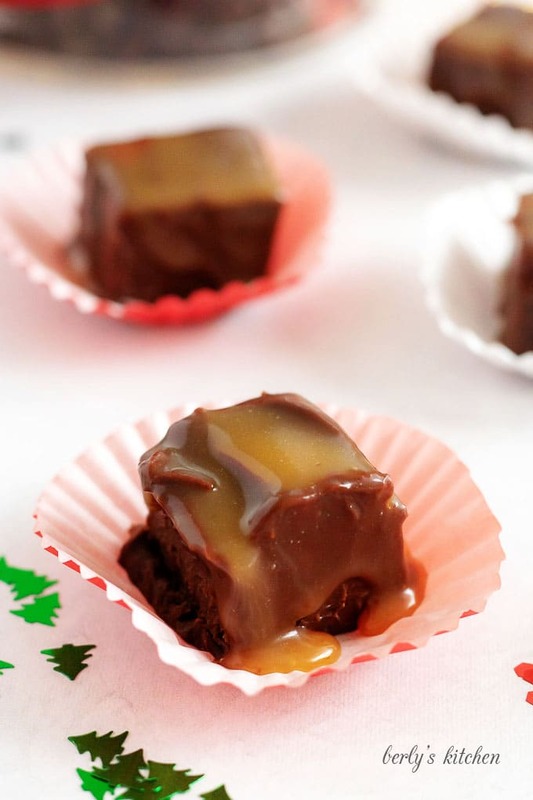 Immediately pour the caramel over the fudge, and place it in the refrigerator for 4 hours. After the fudge sets, remove it from the pan, and cut into squares. Serve immediately, or store in a sealed container in the refrigerator for up to 5 days. *Calories listed are an approximate and based on the ingredients used and serving size listed. 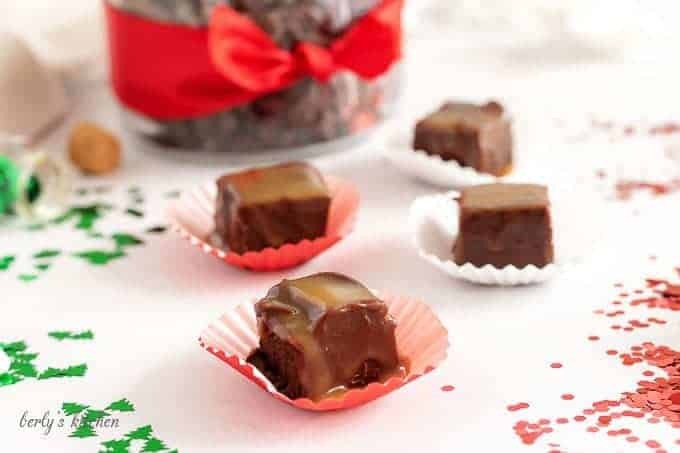 *This recipe is adapted from Boozy Caramel Fudge found in Southern Living Christmas Cookbook (Oxmoor House Publishing, 2015).